Portions of this review also appear in our coverage of the standard Blu-ray release. Christopher Nolan's 'Dark Knight' trilogy has had a tremendous impact on the way filmmakers and studios now approach comic book adaptations. They're now taken with a more serious, often quite dark and very much post-modern tone, interestingly exploring the psychology that makes up a superhero and how he handles the weight of responsibility as protector of humanity's own path towards destruction. Arguably, Ang Lee's largely disappointing 'Hulk' and Bryan Singer's excellent 'X2: X-Men United' were really the first films to touch on these themes; however, Nolan took it further, went deeper and traveled into darker territory. Today, the movie superhero is no longer a comic caricature, but a flesh and blood character, almost human, struggling with grave moral demands that adults can appreciate. Frankly, these more thoughtful aspects to comic-book superheroes come as little surprise, they're familiar themes that have been enjoyed by devoted fans and have already been acknowledged and discussed by academics for decades. The only real surprise is that it took movie studios this long to finally give comics the respect they deserve. Then again, maybe it's not that much a surprise, all things considered. Nevertheless, we're here now, and filmmakers are unafraid to posit our heroes as heavily flawed individuals with quandaries, damaged goods who must overcome their imperfections and personal dilemmas to aspire for greatness. There's also something inspiring in seeing what we previously thought of as perfect as only being good at hiding their inadequacies. One aspect in the Superman mythos not often enough explored for mainstream audiences is the character's desire to know more of his origins and the dilemma over his foreignness. From a story by Christopher Nolan and David S. Goyer — the same pair that made 'The Dark Knight' movies a success — almost the entire first half in 'Man of Steel' is dedicated to this personal struggle with self-identity. Although Clark Kent (Henry Cavill doing his best but never becoming wholly convincing) is adopted by two very loving parents (a surprisingly good Kevin Costner and Diane Lane) and raised in the American heartland of Kansas, he must cope with the fact that he is different from others, that he's an immigrant (or an illegal alien, to be perfectly honest) in the truest sense of the word, a being caught in the middle of two seemingly opposing cultures. This is a fact his parents have chosen not to keep secret from him. 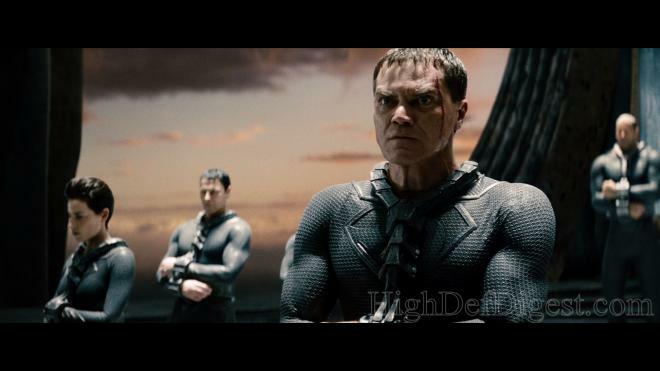 With glitzy, overtly-stylized directing from Zack Snyder ('Watchmen'), the film opens with a stirringly sentimental and feverish spectacle of Jor-El (a rather stiff Russell Crowe) defending his family and the future of his species against a military coup d'état led by General Zod (Michael Shannon in a splendid and memorable role). The scene then plays like an unknown, subconscious presence shadowing the rest of the story, which later becomes a heavy emotional burden when Clark learns he's actually Kal-El, the last son of Krypton. From there, the narrative is told mostly through flashback, revealing small glimpses of a person desiring for acceptance from a harshly judgmental society but denied so often that it grows into a weight of sad memories. After witnessing the death of his human father in a situation in which we know he could have done more, Clark wanders the planet in search of the purpose for his being on Earth while also using his special abilities when the situation requires them. Personally, I love that the filmmakers would be so bold to do this — to have the otherwise seemingly perfect Übermensch (the philosophical concept that essentially inspired Jerry Siegel and Joe Shuster) question his very existence in an imperfect world. This central dilemma is wonderfully encapsulated by the lessons of Clark's father and Lois Lane's (Amy Adams in a role dramatically different from the comics) untiring search for the mystery man who saved her life while she was snooping around a military base in the Arctic. When questioning her pursuit, Laurence Fishburne as Perry White, editor of "The Daily Planet," puts it very succinctly and frankly, a question that in turn reveals a major flaw within us as a supposedly open-minded civilization. This, in turn, places Lois in a dilemma that complements the script's central theme. 'Man of Steel' is the sort of Superman movie I've always wanted to see explored on film: for all his perfections, he struggles with the weight and responsibility of being the savior of humanity and the burden attached to that abstract idea. The moral compass he strives to find and personify is not created from simple black-and-white questions, but gray, murky, and troubling decisions riddled with uncertainty and painful consequences. This is what leads our hero to make a difficult choice when battling Zod, another being guided by his own personal moral compass of wanting to ensure the survival of his species, to do something we wouldn't imagine Superman to do. 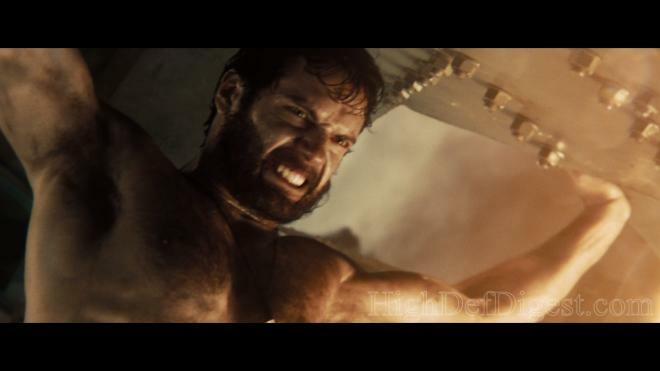 And like our hero, the movie itself is rather imperfect as well (with awkward, sloppy editing, for one thing), but 'Man of Steel' is terrifically entertaining, supported by a thoughtful and weighty script that by and large has me forgiving its flaws while remaining thrilled by its positives. 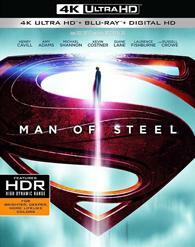 Warner Home Video brings 'Man of Steel' to 4K Ultra HD Blu-ray as a two-disc combo pack with a flyer for a Digital HD Copy. At the moment, we are unable to verify the size of the content, but the triple-layered UHD100 disc sits comfortably opposite a Region Free, BD50 disc inside a black, eco-cutout case with a glossy slipcover. At startup, the disc goes straight to the main menu with full-motion clips and music playing in the background. The last son of Krypton takes a giant, impressive jump forward and makes a smooth landing on Ultra HD Blu-ray in a blaze of fiery explosions and apocalyptic destruction. Compared to its Blu-ray counterpart, unfortunately, the results are not exactly leaps and bounds ahead of its predecessor, which is not to say fans won't be able to note any visible improvements between the two, of which there are a several. Shot with a combination of traditional 35mm film and the Red Epic digital camera system for a few action sequences, the elements were mastered in 2K digital intermediate, and I suspect Warner Bros. did a simple unconvert of that master. The regrettable effects of that are some negligible hints of aliasing along the sharpest edges of buildings, thin structures and a top computer monitors. This also causes some very mild posterization in the faces of the cast, who sometimes appear pasty and drained, but for the most part, flesh tones appear natural with a realistic rosiness during several conversations in daylight. Although I wouldn't qualify it as a night and day difference, the UHD is nonetheless an upgrade thanks to a great-looking HEVC H.265 encode in HDR10 that offers the same extraordinary and often stunning detailing as the Blu-ray. Granted, the 2160p video comes with its share of soft scenes, but thankfully, they don't distract from the well-defined moments that show clean, distinct lines in buildings, spaceships and various other vehicles. Despite not always looking healthy, facial complexions are very revealing with excellent lifelike textures, and the clothing, especially the Kryptonian outfits, exposes every stitch and thread of the fabric. Viewers can better make out the design work that went into the interior of the spaceships while the tiniest piece of debris falling from buildings or explosions is razor-sharp and better detailed here. However, my reservations with the overall quality of the picture are frankly due to the stylized and heavily subdued gritty cinematography of Amir Mokri, giving the film a dour and somber appeal that doesn't translate well to the expectations of the format or compare to other releases. Favoring the orange-teal palette, which is made all the more apparent in 4K, a majority of the 2.40:1 image is so heavily drained that it's often near achromatic with a few scenes almost seeming black-and-white. For all intents and purposes, the transfer does not appear to have been color graded to take advantage of the wider color gamut since the palette doesn't seem all that much different than the Blu-ray. The intentional look has significantly affected primaries, displaying a bit of boldness in the greens, but reds and blues are fairly dark and drab. On the other hand, secondary hues and pastel tones are richly saturated and top-notch, which is one area where the movie benefits from the jump to UHD, animating every scene with stunning, picture-perfect warmth. Best moments are the extreme wide shots of sunsets and sunrises, displaying a demo-worthy array of fiery oranges and golden yellows mixed with radiant magentas and glowing purples. Another area where this 4K presentation shows a clear improvement is a noticeably brighter, more vibrant and energetic transfer, particularly during daylight sequences. In spite of the toned-down contrast, the picture still yields remarkable clarity and resolution in the far distance, revealing the smallest window or tiniest antenna atop buildings. Spot-on, pitch-perfect whites make the film really pop with excellent specular highlights that give the fluffy clouds in the sky an enthusiastic glow. This is most appreciated in the blue flames of the Kryptonian guns and spaceship fires, illuminating the screen with brilliant luminosity and extraordinary detail. Look no further than the opening sequence on Krypton as General Zod's coup d'état erupts into an all-out war. On the whole, brightness levels are dynamic with precise gradations in the grayscale, delivering pitch-black shadows that don't obscure the finer details in the darkest portions. However, it's worth noting that blacks are not always the strongest while also coming off too strong in some areas, almost reaching the point of crush. Nevertheless, with extra fine grain washing over the transfer, providing the presentation with an attractive cinematic quality, this 4K video is a nice upgrade. Giving the Snyder-Nolan-Goyer collaboration another step up over its Blu-ray counterpart is a fantastic, reference-quality Dolby Atmos soundtrack, yielding some amazing results that'll leave fans cheering for more audio upgrades. However, this version is interestingly comparable to its DTS-HD Master Audio soundtrack, which is once again repeated on the accompanying Blu-ray, opening right from the start with a wall of sound that doesn't let up until the end credits. Imaging is highly engaging and expansive with lots of background activity that keeps much of the film within the front soundstage. On the other hand, this lossless mix offers an appreciable improvement with better channel separation and movement across the entire screen. With marvelous, convincing off-screen sounds, the dynamic design is full of warmth and fidelity, peaking into the upper frequencies with room-penetrating clarity while maintaining superb distinction and intelligibility in the dialogue. Filling the screen and the room with the music of Hans Zimmer, a remarkably detailed and sharply extensive mid-range displays each note and individual instrument within the orchestration while nicely bleeding into the front heights for a welcoming half-dome effect. The low-end is responsive with a decently authoritative punch that reverberates through the room, adding some weight to the action and music. 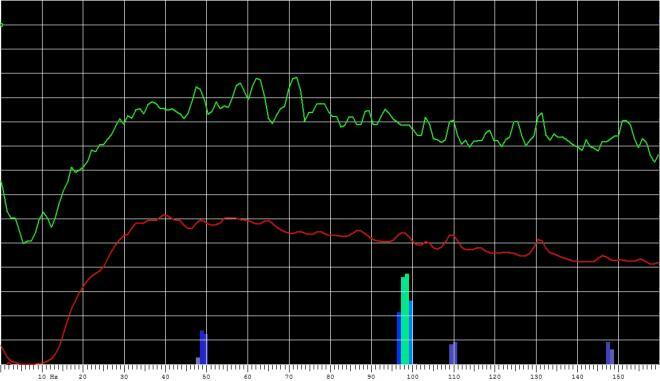 Only, it never really digs very deep or extend far into the lower depths (bass chart). Rear activity is equally exciting, employing the surrounds and overheads fairly often and bursting forth with enthusiasm. Of course, the room comes to life during the action-packed sequences, delivering a consistent wave of discrete effects with superb directionality and flawless panning. Anything from jets, helicopters, alien spacecrafts and Kryptonians speeding across the sky utilize the ceiling speakers at any given chance. Moving, hovering and flying from the front to back and from one side of the room to the other, the object-based track creates an immersive 360° dome-like soundfield with exhilarating realism. Every explosion unloads a surge of gravel, dirt and rock that then rains down all around with amazing clarity and continues to bounce further away. Quieter moments also arrive with subtle atmospherics, like leaves blowing in the wind, birds flying overhead or city traffic resonating all around, filling the many dialogue-driven moments with satisfying activity and making this the best way for enjoying the movie. Strong Characters, Legendary Roles (HD, 26 min) — Generally focused on this modernized reboot of the comic superhero, the discussion is on the changes made to the character while touching on his history and legacy throughout the years. All-Out Action (HD, 26 min) — Looks at the rigorous physical training of the actors, the challenges in the stunt performances and some attention on the stage design and practical effects. Krypton Decoded (HD, 7 min) — Dylan Sprayberry, who played 13-year-old Clark, plays host to this piece on the visual effects sequence done at the beginning of the movie. New Zealand: Home of Middle-Earth (HD, 7 min) — A promo piece for Peter Jackson's 'The Hobbit' and has absolutely nothing to do with the Superman mythos or this particular reboot. Superman 75th Anniversary Animated Short (HD, 2 min) — Celebrates the characters evolution through the decades while John Williams' iconic music plays in the background. 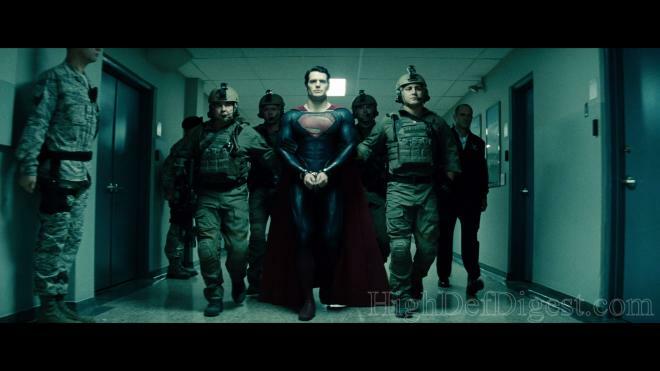 From a story by Christopher Nolan and David S. Goyer, 'Man of Steel' surprises with its thoughtful reimagining of Superman's origins and the personal challenges he faces in his journey to becoming the iconic hero he's known for being. Director Zack Snyder brings his usual bombastic flair but manages to deliver the sort of comic book adaptation fans love to watch and will hopefully serve as the beginning of a new franchise. This Ultra HD Blu-ray arrives with a great-looking 4K video presentation. Though the heavily stylized photography keeps the video from truly shining, it nonetheless offers several noteworthy and appreciable moments that should please fans. Added to that, the movie has been ugraded to a satisfying, reference-quality Dolby Atmos audio presentation, joined by many of the same supplements featured in its Blu-ray counterpart. Overall, the package is recommended for loyal fans and early adopters enthusiastic about the new format.